The Calvin cycle is the series of dark reactions, also known as the carbon fixation stage, which forms the second of the two stages of photosynthesis after photolysis. The Calvin cycle takes place in the stroma of chloroplasts. The overall effect of the cycle is the reduction of carbon dioxide to form carbohydrate. 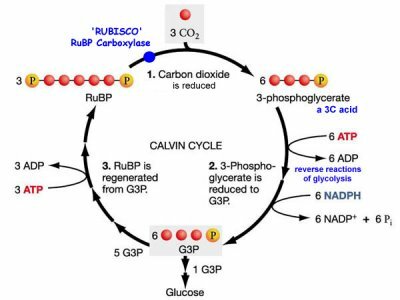 First an enzyme (ribulose biphosphate carboxylase) causes carbon dioxide to combine with ribulose biphosphate (RuBP) to form a six-carbon compound that quickly decomposes to give two molecules of 3-phospho-glycerate (a three-carbon compound). Then, after being changed to glyceraldehyde 3-phosphate (G3P), this re-forms ribulose biphosphate with the release of the sugars fructose and glucose. These sugars are used in respiration or as a building block in making starch and cellulose. The energy to drive the Calvin cycle comes from photolysis. The cycle is name after Melvin Calvin who was the first to work it out.